The project aims to restore 13 ﬁgurative vases of Attic production, all of which are displayed in showcase D in the room dedicated to the Astarita collection, as the Attic vases are part of this group. 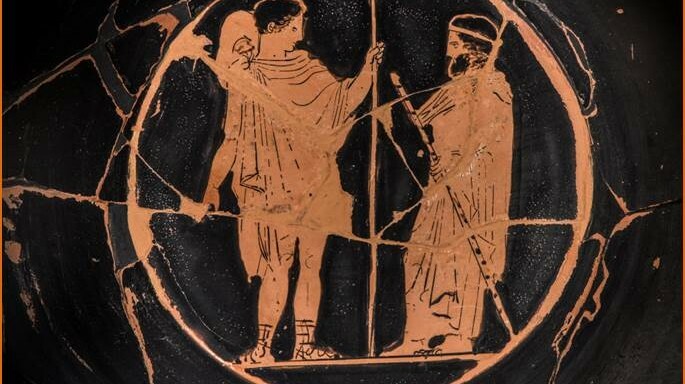 The project involves a review of artists that use the red ﬁgures technique and that were prevalent between the Late Classical Period, up until the era of Hellenism (400 BC to 340 AD). The style and skillfulness of the painter have, at this point, gone beyond the simple reproduction of the real and instead focuses on the representation of feelings. More speciﬁcally, the man’s world has precedence, both in the public and private sphere, as portrayed in the cultural scenes and in the athletic contests. The concept of war, on the other hand, is evoked only by the intimate scenes of a young man bidding farewell. Special attention is given to the feminine world. The Associate Patrons are excited to adopt this as their second restoration project. Donations and commitments to date = $11,799.00. The vases were periodically restored throughout the twentieth century. The materials that were used at the time for the restoration have partially deteriorated and need revision, both with regards to the conservation and to the aesthetic. The new intervention will be carried out with current material and criteria, in order to give back visibility to this important section of the collection.